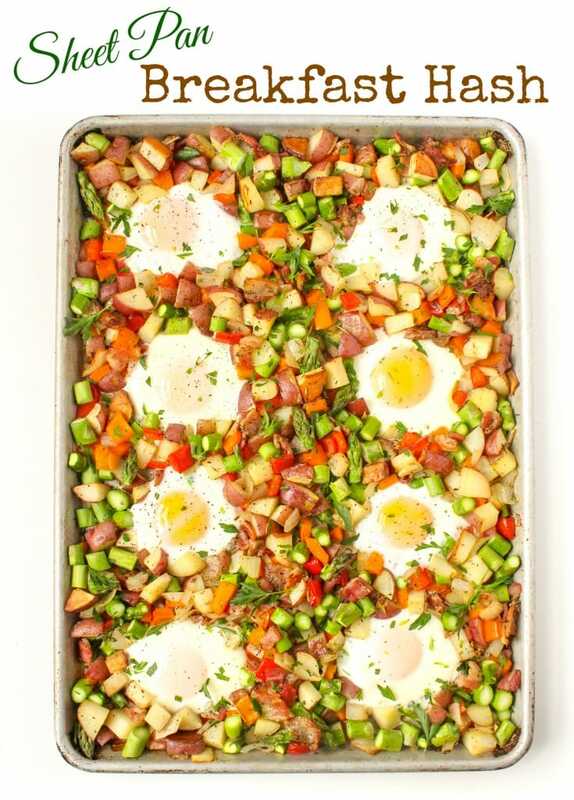 Cooking brunch for a crowd is no problem with this yummy and veggie-packed sheet pan breakfast hash (with optional bacon, because, duh). Prep the veggies ahead of time and then let the oven do the work while you socialize! You guys know I’m obsessed with sheet pan recipes by now (see also: Mix + Match Sheet Pan Dinners // Sheet Pan Maple Curry Chicken // Sheet Pan Asian Salmon with Veggies // Sheet Pan Mediterranean Chicken Thighs). Sheet pan meals are just so EASY – and I love that they aren’t super hands on, so once the prep is done, you can simply set the oven and relax. I especially love sheet pan meals when we have guests over so one of us doesn’t have to man the stove/grill and miss out on all the chatting! With Easter weekend coming up, I figure many of you may be hosting brunches, so I thought – what better time to share a brunch-themed sheet pan breakfast recipe? If you’re not cooking for a crowd, feel free to halve this recipe, or you can always enjoy the leftovers throughout the week; the veggies and potatoes will hold up well in the fridge for at least a few days. If you’re vegetarian, feel free to omit the bacon, but you’ll want to toss the veggies in a drizzle of olive oil to make up for it. The bacon fat keeps everything from sticking to the pan! You can also mix and match the veggies depending on your preferences. For hardier veggies like butternut squash, brussels sprouts, broccoli, cauliflower, and mushrooms, add them in with (or in place of) the potatoes. For lighter veggies like peas or greens, add those in along with (or in place of) the asparagus. 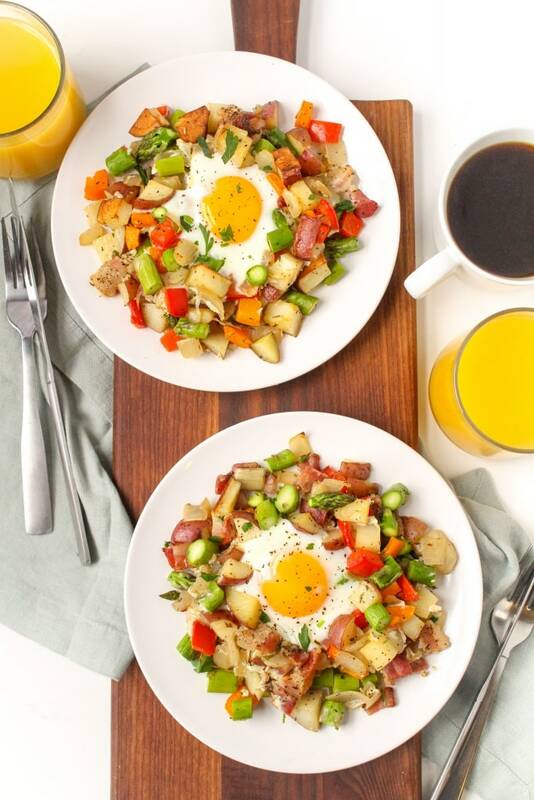 To make this sheet pan breakfast hash, simply dice your veggies, then mix them with the chopped bacon and place them on a sheet pan. Roast for about 30 minutes, or until the potatoes are tender and the bacon is crisp. 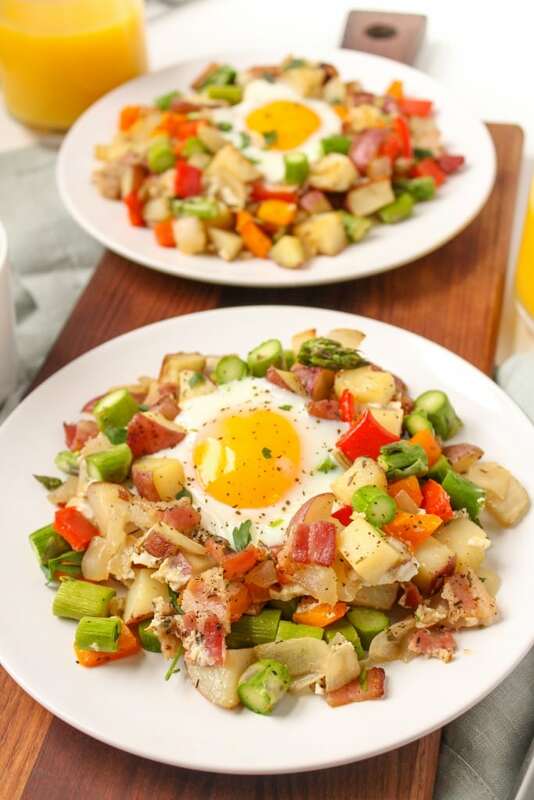 Add the asparagus/lighter veggies to the pan and toss to combine, then move the hash aside to create wells for the eggs. Crack eggs into the wells and bake for another 8-12 minutes, depending how firm you’d like your egg yolks to be. 8 minutes will result in mostly firm whites and runny yolks, 10 minutes will result in firm whites and jammy/medium-cooked yolks, and 12 minutes will result in firm whites and yolks. I love that this sheet pan method can give you jammy egg yolks for a crowd without having to deal with the hands-on egg frying situation. The end result is a hash that is savory and filling but not too heavy thanks to all the veggies. Here’s the full recipe – please let me know how you like it! 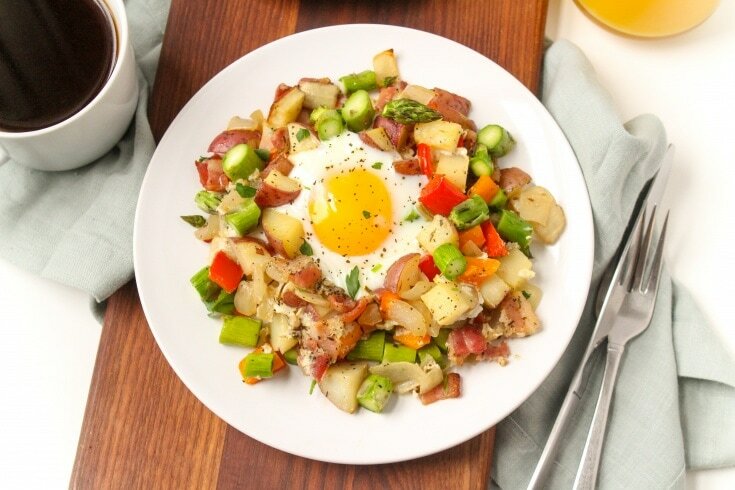 This savory and filling one-pan hash makes a great breakfast for a crowd. Toss potatoes, bell peppers, onion, bacon, granulated garlic, herbs de provence, and a pinch of salt and pepper together. Arrange in a single layer on a sheet pan. Bake vegetables and bacon for about 30 minutes, until potatoes are tender and bacon is crisp. Add asparagus to the pan and toss to combine. Move vegetables aside to create wells for the eggs. Crack eggs into the wells and bake for another 8-12 minutes. 8 minutes will result in mostly firm whites and runny yolks, 10 minutes will result in firm whites and jammy/medium-cooked yolks, and 12 minutes will result in firm whites and yolks. This hash can easily be made vegetarian by swapping the bacon for a drizzle of olive oil. As the bacon fat renders it keeps everything from sticking to the pan, but tossing the veggies in a drizzle of oil before roasting will work as well! These veggies can be swapped out for pretty much any other veggie. 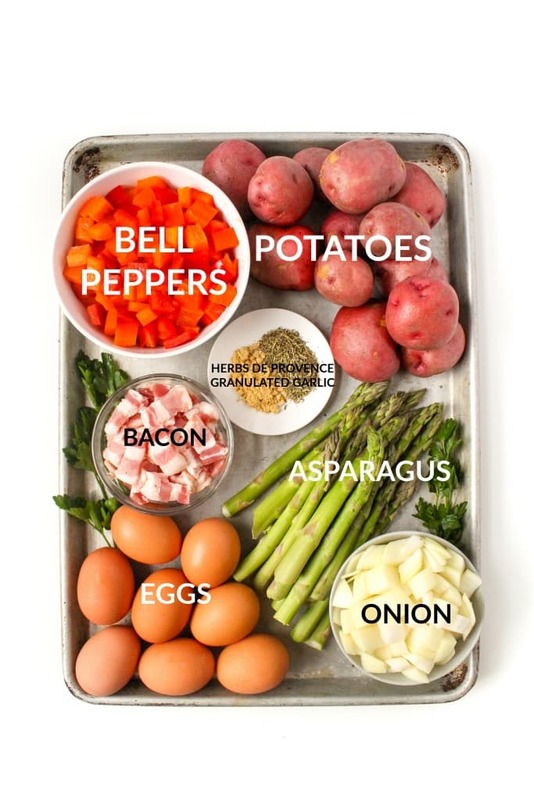 Add veggies that can handle roasting like butternut squash, brussels sprouts, broccoli/cauliflower, mushrooms, etc in with the potatoes, and add lighter veggies like peas or greens instead of/along with the asparagus. Thanks! I hope you’ll try it and let me know how it goes! What an awesome idea!! Matt and I will need to make this soon for ourselves. Hands-off drippy eggs sound fabulous. Let me know how you like it, Kori!